Work on this large dental surgery complex began before its complete programme was known. 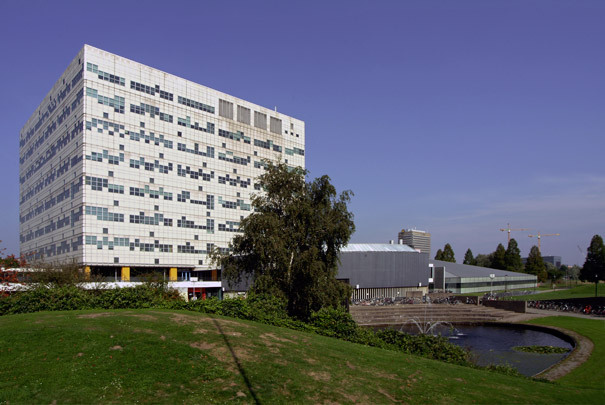 Building took place in several phases: a high-rise for clinical work, a low-rise pre-clinical department with shed roofs, a workshop, research labs and circular lecture rooms. The square building derives its great depth from the size of the surgeries. Mart van Schijndel later added a lightweight laboratory building on a concrete slab next to the tower (1988-1990). Daylight is delivered in through an agglutinated glass facade and through expanses of glass in the pyramid roof. The building was in use as Faculty of Pharmacy since 1990. The building was demolished in 2014.